As a young homeowner, I don't exactly have a ton of cash to be throwing around on home decor. So as you may have already figured out, I like to get my house looking the best it can in the cheapest way possible. Many times, this means repurposing old things in a new way. While we were purging items from our old apartment, we really didn't get rid of much furniture or decor - we packed it all up, knowing that it would be used, someway, in our new home. Sure, plenty of those things we brought with us have no place else to live but the basement (which is becoming a little living area in itself), but we've been able to incorporate a few of the pieces all over the house. Yes, we really did have an entire wall painted chartreuse. And at the time I absolutely loved it. (I still do, but that bold color would have swallowed our new living room right up). When we moved into the apartment, we went to a local thrift store and stuffed our cart with a pile of empty frames; It didn't matter what color or what was framed inside (I believe one framed a cross-stitched cat in a wildflower patch), we just found interesting frames and chucked them in the cart. Once we got them home, we dusted them off, primed them and started on their transformation. I believe there was a brief stint where we attempted hand-painting, but laziness set in, and we decided spray painting would be much more efficient. (In hindsight, the hand-painted frames wouldn't have looked as nice). After a couple of coats, they turned out all shiny, snazzy and scarlet red. If you look at the photo above, the big Block-O-shaped frame always reminded me of Ohio State's logo. It took everything I had not to glue a little buckeye in the corner. 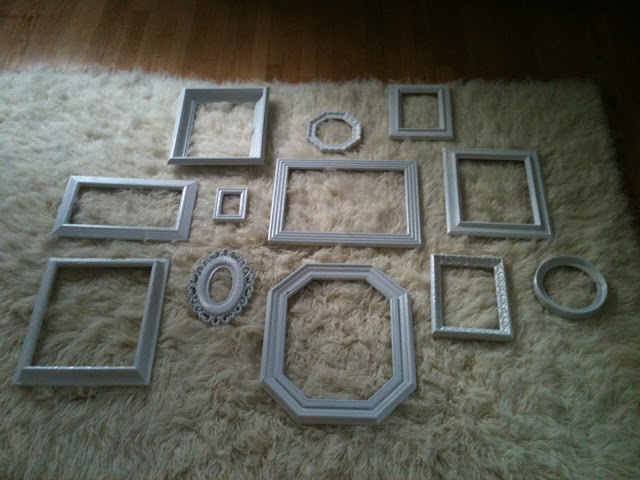 Anyway, I really loved the look of those frames and knew I wanted to use them again in our house. So I snapped a photo of them on the wall before we moved so I could remember their position and try to do the same thing on a wall in our house. But the ceilings in our house are a bit lower than in the apartment, so we knew we'd have to change things up a bit. So, first thing's first, we bought two cans of glossy white paint from Home Depot, took our frames in the backyard, laid them on cardboard and sprayed away. No priming was necessary. 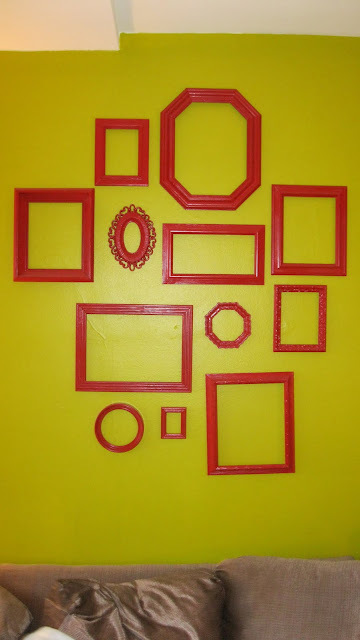 Back when we hung the frames in our apartment, we took the steps to lay them all out on newspaper, trace their shapes, indicate the space there the nails should go, and taped the newspapers to the wall to ensure perfect placement. Everything was spaced nice and evenly, and looked great. This time around, we were running against time and just wanted to get some things on the wall. We didn't want the frames perfectly lined up, anyway, so this relying-on-a-photo worked famously for us. Eric was on hanging duty, so, starting from the the middle, I grabbed a couple of frames at a time to hand to him and told him where they should be placed on the wall, right above the (new!) couch. The entire hanging process was done in about 10 minutes. Even in their new incarnation, I still love the look of these empty frames. I think they look especially chic and a little more grown up in their new crisp, white hue. They really pop from the gray wall! What have you repurposed at home that's taken on a whole new life? Sometimes all it takes is a coat of spray paint! Love this idea, and the white frames look beautiful. Love the arrangement as well!